Home-Grown Entertainment: Hardwick's Modern Times Theater is a Family Affair | Features | Kids VT - small people, big ideas! Hardwick, Vermont, has a reputation as a local food hot spot thanks to Ben Hewitt's 2010 book, The Town That Food Saved. But puppeteer Justin Lander makes a case for another savior. "As much buzz as local food gets," says Lander, "local entertainment is also really important." That's what Lander and his wife, Rose Friedman, are serving up. The East Hardwick residents — parents to 7-year-old Eva and 3-year-old Charlie — founded Modern Times Theater, a troupe that specializes in unplugged amusement for the whole family. In March, Modern Times presents three Saturday-afternoon puppet shows in Hardwick, in the unoccupied ground floor of the Gohl building on Main Street, which the pair dubbed the Blinking Yellow Light Theater. The exquisitely restored 1895 storefront is a fitting setting for these original, old-timey shows — a trilogy based on 300-year-old Punch and Judy routines. The festive preshow entertainment includes popcorn, donuts, live novelty music and a real gramophone that kids can crank. The stars of the performances are Lander's lovingly crafted papier-mâché puppets. He makes them with cornstarch glue, newspaper, brown paper bags and paint. Some heads and hands he carves from wood, others he fashions from recycled cloth. He designs certain puppets to surprise the audience — a monkey sticks out its tongue, a baby pees by spraying water, and a cyclops has an eye that comes out of its socket (it's attached with a thick rubber band). During shows, Lander works the puppets behind the set while Friedman, seated in front, narrates the action. Live music energizes this low-tech spectacle, with Friedman on ukulele, and Lander laying down the puppets and playing cornet. Audience members who attend all three shows will hear the pair play an upright bass, a five-string banjo, a bicycle pump and a completely original "Garbage-matron" that Lander assembled from junk, noisemakers and toys. "It's the opposite of Netflix-centered, California-centered entertainment," he observes. In fact, it's hard to imagine Modern Times' puppet shows springing up anywhere but Vermont. Friedman and Lander met while working for the world-renowned Bread and Puppet Theater in Glover. The innovative, grassroots company is known for its enormous papier-mâché puppets, left-leaning politics, and the homemade bread and garlicky aioli served at performances. Baked goods play a role in Modern Times' Saturday Storefront Puppet Show Series, too — during a break in the action, Lander will raffle off a cake baked by Glover-based Red Sky Trading. On and off the stage, the couple gives off a playful, vintage vibe. Lander sports a mustache. Friedman wears a headband to tame her thick, black bob, and favors dresses over jeans when performing. Their creative yet industrious approach to life is evident during a visit to their home — a 1790s farmhouse with a 1970s addition — on a Saturday afternoon in February. 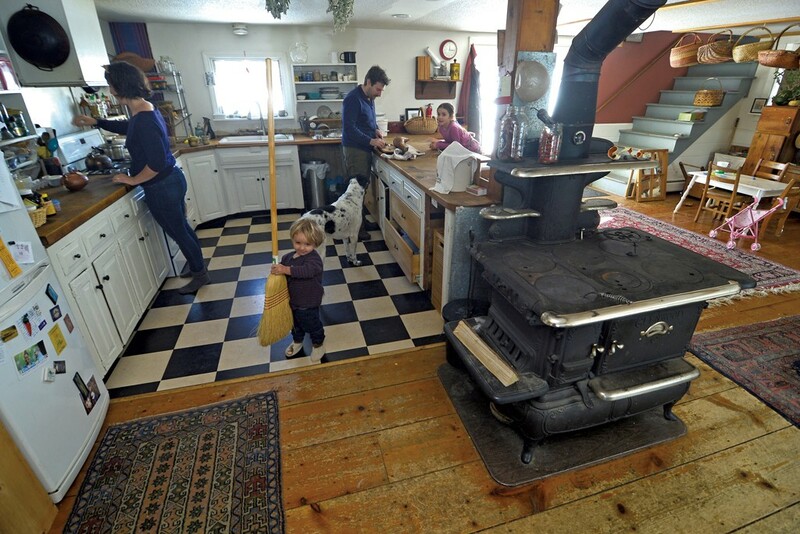 A small greenhouse, used for seed starting, leads into a spacious living room and kitchen, heated by a central wood-burning cookstove. Soup simmers on the stovetop in a well-used, green Dutch oven. The space is filled with stacks of library books, wooden toys and instruments, including an upright fiddle and a large bass drum. A yellow and red hammock hangs from ceiling beams, and an oversized rainbow Slinky lies at the bottom of the stairs. The two speak passionately about their lifelong fascination with the stage and their determination to turn what might have been a hobby into their livelihood. Friedman, 36, is an only child. Her mother worked as a director and playwright, and her father acted — often they worked on the same production. The name Modern Times Theater is recycled from her parents' troupe, which performed politically motivated theater, including protests against the Vietnam War. Between her parents' touring and their various jobs in higher education, Friedman's childhood was marked by a series of moves. Her family lived in Ohio, Bangladesh, the United Kingdom and New York City. "It took me a while," she admits, "to recognize theater was actually my passion and wasn't something my parents were foisting on me." While studying at the New School university in Manhattan, Friedman spent a semester in 2002 at the Moscow Art Theatre through the National Theater Institute. When she graduated from college, she joined Bread and Puppet as a company member. In contrast to Friedman's artsy roots, Lander, 42, describes his parents as "straight-up scientists who literally met in the lab." As a boy in New Jersey, he obsessively made things with his hands, such as, at age 11, "a museum of oddities." Creating stand-up comedy routines was a favorite hobby, and, all through his teen years, he played in a rock band. He studied psychology, with a focus on neuroscience, at Bates College in Maine, but gradually shifted away from the family's scientific track as his work in a mental health hospital and, later, with refugees seeking asylum, widened his experience. Joining the performing staff at Bread and Puppet offered him the opportunity to mix the "activist-y world and music." He also helped reinvigorate the theater company's farm. After Lander and Friedman married in 2007, they linked up with two other couples, bought a short school bus and spent three months on the road, performing original musical skits in pick-up gigs as far west as Minneapolis and as far south as New Orleans. "We were six stinking puppeteers in a dirty bus," Lander says with a laugh. "We could burn the grease we got from a Chinese restaurant, and it was fun." 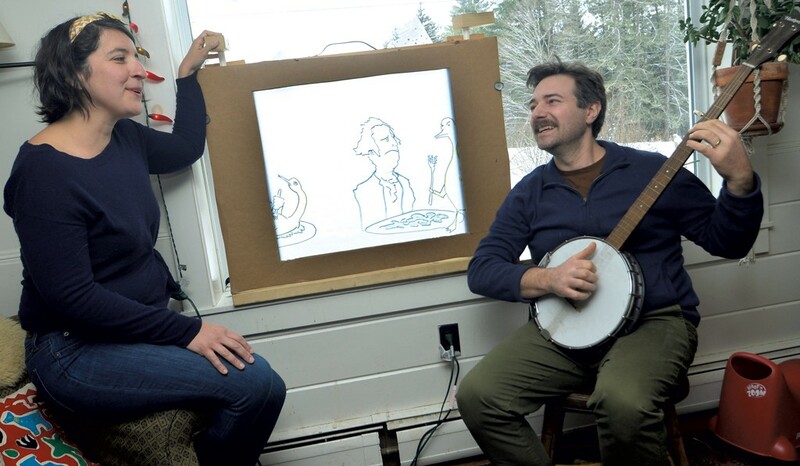 Lander plays the banjo while Friedman turns the crank of a handmade paper "movie." When they returned to Vermont, they were determined to set down roots and begin a family. Lander and Friedman purchased an old farmhouse on a hillside just outside East Hardwick, population 1,100. Friedman calls the village "a little jewel hidden off the highway." The couple was mesmerized by aspects of rural living, like how dark the sky is at night, and the way in which people make their living from the land. 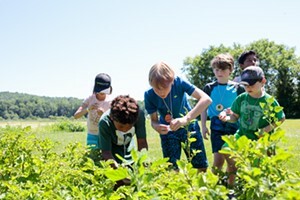 From friends and neighbors, they learned to grow and preserve their own produce, raise livestock and cut meat. They quickly discovered that their house needed a lot of work. They've rebuilt and insulated the older section, wall by wall, and have plans to replace the roof this year. Friedman's parents, now retired, live in a house they built on a section of Friedman and Lander's 17 acres. The arrangement is "the dreamiest long-term option," Friedman says. Eva and Charlie can walk unaccompanied to their grandparents' door and are learning, Friedman says, that "Grandma and Grandpa are going to help you do this, but also, I need you to help them." The symbiotic arrangement also allows the couple, who homeschool Eva, regular kid-free time. In backroads Vermont, Friedman acknowledges, "homeschool is also car-school a lot of the time," ferrying kids between friends' homes and activities. A deeper thread of the couple's educational philosophy is their desire "to include our kids so entirely into our work, so that it isn't You're going here and we're going there." "At the same time, it's a family business we're running," she continues, "with deadlines and stresses. We'll be in the middle of reading a book, and I'll go, 'Hold on!' and jump up and do something I'd forgotten. I sometimes worry Eva isn't getting what she deserves, but then I also think, That's so cool, because she's right there in it." Eva has appeared on stage in small roles, and her brother made his first cameo appearance as an infant. From the beginning, Friedman and Lander aspired to balance a homesteading-based family life with earning a living as artists — two endeavors which generally don't mesh in rural Vermont. At first, they believed they would have to choose between those two paths. Then, in 2009, they teamed up with friends Maya and Brent McCoy, also of Hardwick, to start Vermont Vaudeville, a company welcoming to families but with more adult material than Modern Times. Vermont Vaudeville's shows, performed twice a year in the Hardwick Town House, quickly grew in popularity. With a core cast of seven and rotating guest performers — from magicians to break-dancer Snap Boogie — the shows mix comedy, live music and circus acts linked by a common theme. Last fall's humorous and Vermont-specific "Front Porch Forum, The Musical" was a big hit. 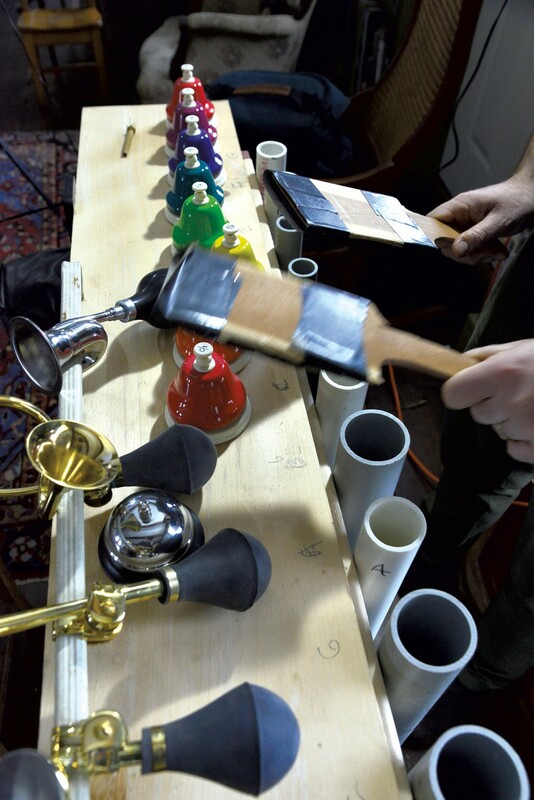 In 2014, a grant from the Vermont Arts Council enabled Vermont Vaudeville to make a statewide winter tour, which included performances at the Flynn Center for the Performing Arts in Burlington and Bennington's Oldcastle Theatre Company. Vaudeville's success made the couple realize that growing a devoted local following was not just a pipe dream. "I never knew it was a possibility as a performer to know so much of your audience, which is what living in a small rural area gives you," Friedman says. "It's pretty nice." The family's East Hardwick abode features a wood-burning cookstove. 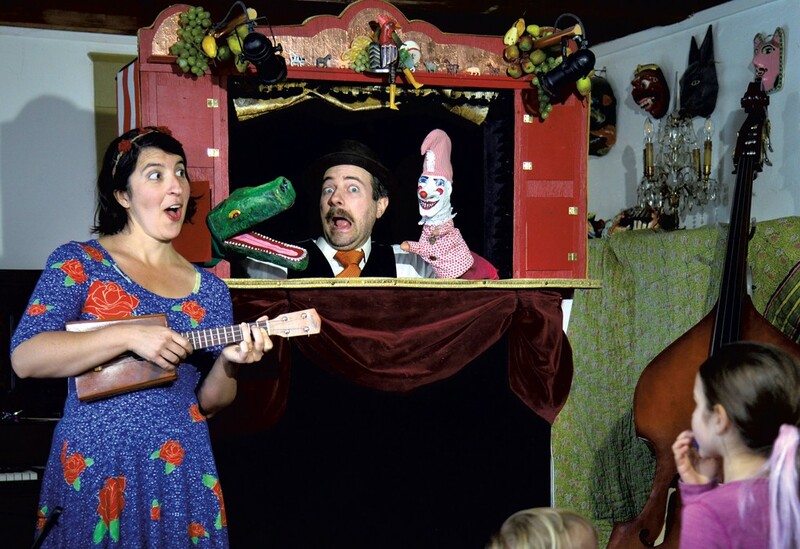 Each summer, Modern Times Theater produces a new Punch and Judy show based on the Collaborative Summer Library Program theme. The troupe performs in numerous libraries around the state, at festivals — such as First Night North in St. Johnsbury and Sandglass Theater's Winter Sunshine Series in Putney — and offers school residencies. To make ends meet, the couple has worked a variety of jobs through the years: Friedman as a children's librarian and Lander as a sugarmaker and carpenter. Last year, they made what Lander describes as a "leap of faith" and committed themselves almost entirely to their creative work, although Friedman continues to do occasional homeschooling evaluations for local families. The couple often doesn't have a set schedule six months out, which creates what Friedman calls a "very scary" and uneven financial landscape at times. Still, she describes their life as "incredibly rich and meaningful beyond any measure." She and Lander cultivate an enormous garden, raise beef cows, tend a flock of chickens and raise pigs with a nearby family. Until recently, they had a milk cow, too. The notion that entertainment is linked to a specific place — bucking generic, mainstream, digital entertainment — is evident in the couple's love for the 1860 Hardwick Town House. Now in their 10th year performing Vermont Vaudeville on that stage, Friedman and Lander note that their live music and comedy shows resemble performances that captivated audiences over 100 years ago. Why is the work they're doing important? Lander points to Hardwick's annual Memorial Day celebration at Atkins Field, the site of the town's early 19th-century granite industry. The local food co-op sets up shop on one side of the field, with alternative healers and organically centered businesses, while, on the opposite side, the Kiwanis Club organizes a chicken barbecue with traditional fair vendors and traveling carnival rides. The divide, Friedman and Lander acknowledge, reflects a tension between long-established, multigenerational families and more recent transplants, often from out-of-state — a cultural division in Vermont by no means unique to Hardwick. The couple readily acknowledge that their goal to unite these two halves through live, local entertainment might be impossible. But that won't stop them from trying. "One of the real hopes for the Vaudeville project," Lander says as he leans forward intently, "is that the Town House be a totally democratic space, equal, open, all welcome and comfortable — for everyone — not for this half or that half. "At this moment, what better work could we do?" he continues. "Theater is a place in America today that is supposed to be for everyone. To have everyone laugh at the same thing right now would be a miracle." The Saturday Storefront Puppet Show Series takes place on March 3, 10 and 17, at 2 p.m., at the Blinking Yellow Light Theater, 101 South Main St., in Hardwick. $7 suggested donation per person at the door; sponsored by the Vermont Community Foundation and the Northeast Kingdom Arts Council. Info, moderntimestheater.com.